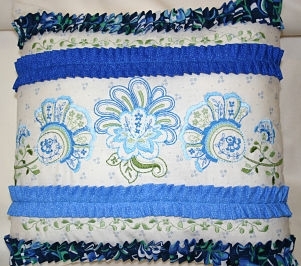 This pillow is based on one in Kay Hickman’s March “All About ME” (Machine Embroidery) webinar. I was afraid the ruffle fabrics would fray away if it were cut with scalloped edges, so I cut 3 1/2 inch strips for my ruffles that I sewed, turned, pressed and ruffled for the pillow. The Gathering Foot #16 would have had a tough time working its magic with the seam allowance down the center of the fabric strip. The Ruffler #86 plowed through perfectly.